Since late 2013, Beijing has been promoting its “Maritime Silk Route” (MSR) initiative as a proposed oceanic complement to its various overland “Silk Route” projects. Details remain sketchy, but the proposal appears to envisage a system of linked ports, infrastructure projects and special economic zones in Southeast Asia and the northern Indian Ocean. While much of the public discussion to date has focused on ports and infrastructure, probably of greater significance is the development of new production and distribution chains across the region, with China at its center. The concept might be seen as akin to Japan’s “flying geese” strategy of the 1970s when Japanese companies outsourced component production to successive tiers of lower-cost states in Southeast Asia. If implemented, the initiative would bind countries in the Bay of Bengal and the northern Indian Ocean much closer to the Chinese economy. Several states in the region, including the Maldives, Sri Lanka and Bangladesh have indicated an in-principle agreement to participate in the MSR and are keen to encourage Chinese investment in port and transport infrastructure and manufacturing facilities. India has been much more circumspect about the proposal, and the visit of President Xi Jinping to Delhi in September 2014 failed to elicit an endorsement of the project from Prime Minister Narendra Modi. Although China has long claimed that its interests in the Indian Ocean region are purely economic, it’s increasingly clear that the MSR could have a major impact on the strategic balance in the Bay. For some years there’ve been concerns in Delhi and Washington about the security cooperation between China and various Bay states and the strategic significance of Chinese control over port infrastructure in the region. We’re now seeing considerable maneuvering among China, India, the United States and even Russia in building defence relationships in the region. In fact, China’s defence relationships in the region are probably thinner than claimed. Despite the hype, China actually has few “friends” in the Bay (or indeed elsewhere in the Indian Ocean) who would be willing, for example, to host military-related facilities. Despite longstanding concerns about Myanmar’s apparently close defence and security relationship with Beijing, Myanmar has never allowed China to use its military facilities or develop a military presence in the country. The security relationship between Bangladesh and China may also be more circumscribed than is often claimed. China has long been the principal supplier of equipment and training to the Bangladeshi armed forces and Dhaka’s plans to acquire two Chinese submarines caused considerable heartburn for the Indian Navy. Subsequently, and much to Delhi’s delight, Dhaka announced in November that it would instead acquire two Russian submarines as part of a larger defence deal with Russia. Moscow has flagged that Russia intends to return as a significant strategic player in South Asia and is targeting Bangladesh as a key partner. Some analysts have also raised concerns over Chinese proposals to develop a new deepwater port at the Bangladesh island of Sonadia which, it was claimed, could be open to use by the Chinese navy. However, following considerable pressure from Delhi, Dhaka has now opened up bidding for Sonadia and other ports in Bangladesh to international investors and is hoping for it to be developed and operated by a consortium not dominated by China. But Sri Lanka may now be becoming China’s closest strategic partner in the Bay. 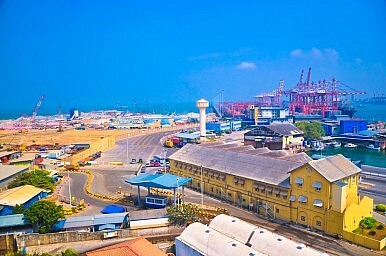 Since the end of Sri Lanka’s civil war there has been significant Chinese investment in the country. Colombo has been keen to cultivate Beijing as an economic partner to drive development and as a diplomatic partner to help fend off international pressure over human rights issues. Sri Lanka has now cast itself as China’s primary partner in the MSR initiative. In recent months there’ve been increasing indications of Sri Lanka’s willingness to give China access to military-related facilities. In October 2014, apparently as part of the MSR initiative, it was revealed that China has been invited to take over management of a new and enlarged Phase II development of Hambantota port, which will include berths dedicated for Chinese use. The government has also proposed the establishment of a Chinese-run facility in northern Sri Lanka to support the Sri Lankan Air Force. Concerns about a possible Chinese military presence in Sri Lanka have been heightened by visits in September and October 2014 of Chinese submarines to a new Chinese-built port in Colombo. Although the Sri Lankan government initially sought to keep the visits secret, they seem to be a deliberate signal by China that it is intends to maintain a submarine presence in the Indian Ocean and that Sri Lanka will play an important role that strategy. It’s not yet clear to what extent those arrangements will involve an overt Chinese military presence in Sri Lanka, but such a presence would have a significant impact on security dynamics in the Bay of Bengal. Sri Lanka, strategically located in the central Indian Ocean and with a stable and cooperative authoritarian regime, would seem to tick a lot of strategic boxes for China. Certainly China’s growing security relationship with Sri Lanka casts significant doubt on Beijing’s claims that the MSR is only an economic project. David Brewster is a Fellow with the Australia India Institute and a Visiting Fellow with the Strategic and Defence Studies Centre at the Australian National University. He is the author of India’s Ocean: the Story of India’s bid for regional leadership. His research on the Bay of Bengal was funded by a grant from the Australia India Council. This article was first published in The Strategist, the Australian Strategic Policy Institute blog, and is reprinted with kind permission. Modi's Trip and China’s Islands: The Battle for the Indian OceanChina’s 'One Belt, One Road' To Where?Sri Lanka’s Constitutional Crisis: The Geopolitical DimensionChina Deploys Diesel-Electric Attack Submarine and Rescue Vessel in Indian OceanWhat's a Recent Chinese Naval Deployment to the Eastern Indian Ocean About?